We just got some hands-on with the LG's new flagship, the G2. It's a phone that has everything going for it, except for the using it part. 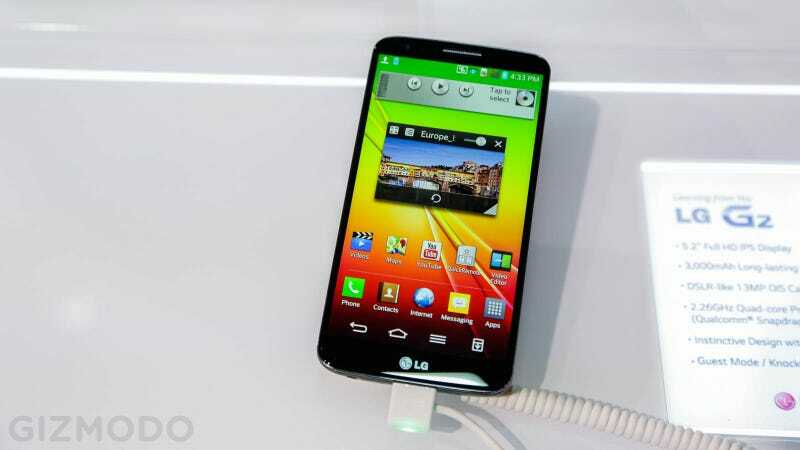 For starters, the G2 feels very thin and light, comparable with the Samsung Galaxy S4. The two phones even look alike—much to Samsung's chagrin, we're sure. They both have that same plasticky back, and they're pretty close in size, with the G2 being a little bigger, but to be fair, its screen is 0.2 inches larger, too. It's best to think of the G2 as a compromise between the Galaxy S4 and the Galaxy Note II, if those were two screen sizes you were for some reason trying to reconcile. Speaking of the screen: It's big, bright, and colorful, though it isn't quite as bright as the HTC One, and blacks weren't as dark as they are on the Galaxy S4. It seemed to stand up to sunlight just fine. It's good in the way that you won't be overly happy or sad with it. It's just there. The feature that stands out the most is that the only physical button is on the back of the phone, directly below the camera. It's a volume rocker with a multi-use button in the middle. LG claims it's a triumph of ergonomics. We thought it was... fine. We like that it's equally convenient for right-handed and left-handed people, but we'll have to do some extended testing before we could really say if it's any kind of advantage. The phone was generally fast, thanks no doubt to that snappy Snapdragon 800 processor inside. The G2 opened apps quickly, and flicked around the desktop and app drawers in a blink. The trouble starts, though, when you actually try to do anything. We'd hit an icon and it would pause before opening it up. We also had one unit completely freeze on us. The phones seemed to be running some kind of demo software, so to be fair, it may be better in the product that actually gets released, but that's a very big maybe. Especially considering just how bad things get from there. The software is a nightmare. Especially after using Motorola's super clean, attractive, and intuitive software on the Moto X (which is basically just stock Android), this is like a developer got all hyped up on Jolt Cola and went nuts. It's not unlike Samsung's TouchWiz in that it's extremely busy and packed to the brim with features no one will never use. But it's worse. It's significantly uglier, with icons that look like something off a feature phone from ten years ago. And the useless features are even more useless. Haven't you always wanted to simply knock on your phone like it was a door in order to turn the screen on? No, you bloody well haven't. Everywhere you turn there's a cacophony of settings in all sorts of random places. Swipe down the notification panel, and you're inundated with clutter that fills half the screen before you even get down to the notifications themselves. The power button seems to turn the screen off, but not back on (at least in the demo software). It's just bad UI, and it's a major disappointment. How could LG have not learned this lesson yet? At least LG opted to go with Android's standard on screen buttons. Just kidding! The G2 includes the Home and Back buttons from stock Android, but adds an onscreen menu button instead of a button for multitasking. This seems unnecessary, but who knows, maybe we'll end up liking it in extended testing. You access multitasking by long-pressing the home button. How do you access Google Now, one of Android's most compelling features? We still don't know. Possible software advantage? If your phone rings and you put it to your ear, it will answer. Cool right? But Samsung did it first. It looked like the camera's OIS worked pretty well, and at first glance the photos looked nice (that's something we'd have to check on a full-sized monitor, though), but there was definitely some shutter lag. Certainly more than you find on, say, the HTC One. All things told, the G2 is still a phone we're looking forward to giving a full rundown, but that's almost entirely because of the hardware. Once you're in the safe confines of an app, we expect that Snapdragon 800 to keep things moving briskly. But the built-in software (LG's heavy skin running over Android 4.2.2) is a massive disappointment on first glance. Compared to the OS on other modern smartphones (the Moto X, the HTC One, Stock Android, Windows Phone, iOS) it looks tired, ugly, and just completely out of touch with what people actually want from a phone.